DD Form 2863 - also known as the "National Call To Service Election Of Options" - is a Military form issued and used by the United States Department of Defense. The form - often incorrectly referred to as the DA form 2863 - was last revised on April 1, 2006. Download an up-to-date fillable DD Form 2863 down below in PDF-format or find it on the Department of Defense documentation website. AUTHORITY: Section 510, Title 10, U.S. Code. program and document a member's incentive election under this program. internal to the relevant Service. DISCLOSURE: Voluntary; however, failure to furnish personal identification information may negate the enlistment application. under the provisions of the National Call to Service program. reenlistment/extension of two (2) years or more will fulfill the Selected Reserve phase of the MSO. further understand that this selection of incentive is irrevocable. 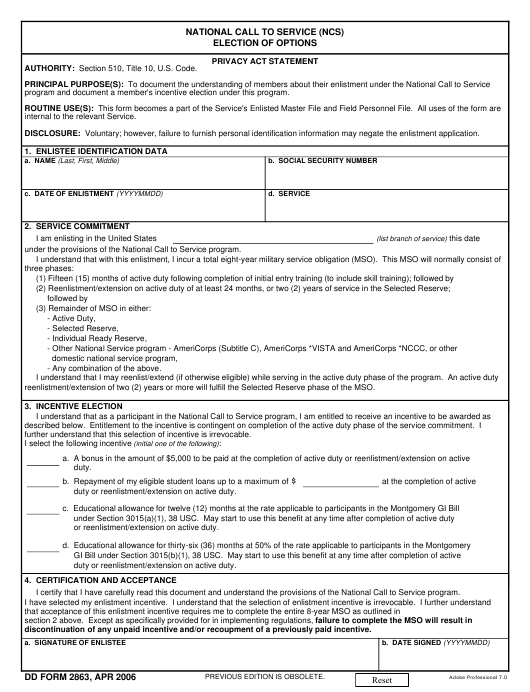 duty or reenlistment/extension on active duty. or reenlistment/extension on active duty. I certify that I have carefully read this document and understand the provisions of the National Call to Service program. discontinuation of any unpaid incentive and/or recoupment of a previously paid incentive.